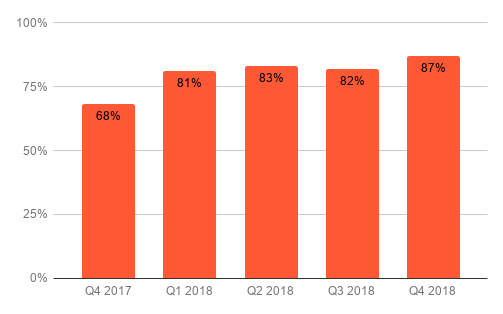 The average video completion rate jumped to 87% in Q4 2018, its highest for the year and a nearly 28% increase over 2017’s Q4 of 68%. That helped push the 2018 full-year average to 83% vs 70% for 2017. The strong and steady growth we’ve seen in average VCR over the past few years is a boon to advertisers who favor viewer completion metrics over click-through rates. 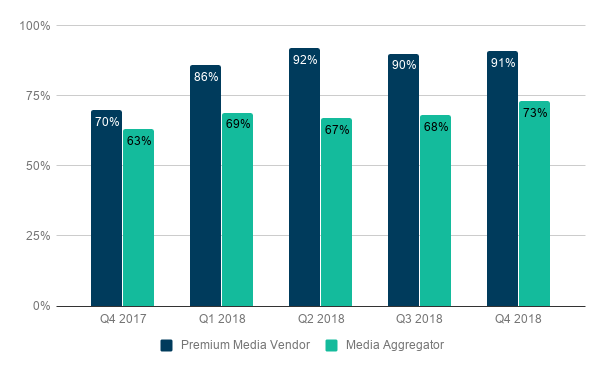 Video completion rates for premium publishers surged throughout 2018, hitting 91% in Q4 vs 70% in Q4 2017. Aggregators grew a more modest 11%, with quarterly percentages mostly in the 60% range. The ongoing appeal of premium sites is dictated by a number of factors, including high completion rates, that sustain their ability to engage consumers in a reliable, brand-safe environment. 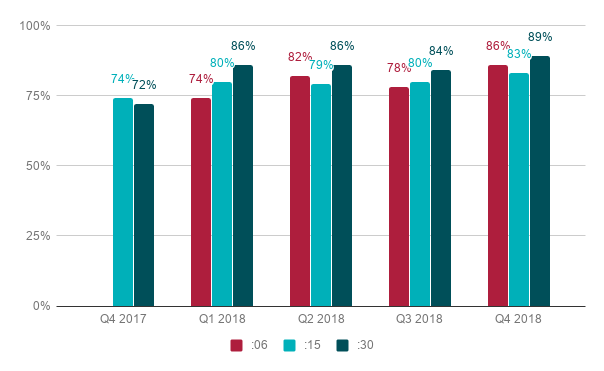 Completion rates for both 15- and 30-second ads grew steadily throughout 2018, but it was the longer length that experienced the biggest spike at the end of the year. In Q4, 30-second ads hit 89% vs. 72% in Q4 2017, a 24% increase. 15-second ads grew by half that, logging 12% growth in Q4 with completion rates of 83% in 2018 vs. 74% for Q4 2017. 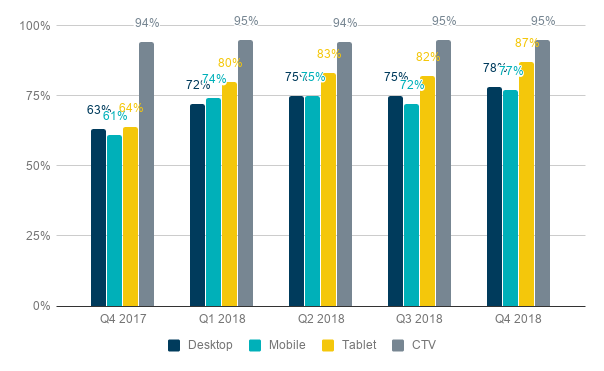 While video completion rates are rising across all devices, CTV stands apart with 95% of video ads playing all the way through—a percentage that has seen only slight fluctuation over the past 8 quarters. No other category came close to CTV in terms of percentage share, but completion rates in other devices also logged solid growth. From Q4 2017 to Q4 2018, desktop, mobile and tablets hit 24%, 26% and 36% respectively. We believe the reason CTV consistently outperforms the other devices in this metric is that viewers tend to be committed to the content they’ve chosen to watch, don’t seem to be interested in clicking around to bide time while waiting for the program to return and typically don’t have the option to skip the ads.